Distracted driving is any non-driving activity a motorist engages in that has the potential to distract him or her from the primary task of driving. Stressful jobs, busy lifestyles and technology are just a few reasons why individuals may engage in distracted driving activities. The U.S. Department of Transportation reports that in 2012 (the most recent year data is available) 3,328 people died in crashes linked to driver distraction, and more than 421,000 more people suffered a distracted driving-related injury. In fact, 17 percent of all crashes resulting in an injury involved driver distraction. Cognitive distraction takes your mind off the road. Visual distraction takes your eyes off the road. Manual distraction takes your hands off the wheel. It is important to note that all three types of distraction don't have to happen for a driver to be dangerously distracted. While all distracted driving is dangerous, texting is the most alarming because it involves all three types of distraction at the same time. You're not looking at the road. Your hands aren't on the wheel. You're not focused on driving. People who text while driving are 23 times more likely to crash. Studies have found that your reaction time will be about 30 percent worse if you're trying to text and drive. You'll spend an average of 10 percent of your time out of your lane. When you look down to send or read a text while driving, you take your eyes off the road for an average of almost five seconds. Doesn't seem long - but a person driving at 55 MPH travels the length of a football field in five seconds. Regardless of what you may think, no one is "good" at texting and driving. Consider this: When asked, the vast majority of people who admit that they text while driving claim to be able to do it safely. However, when tested on a simulator that uses everyday hazards (People crossing the road, animals crossing, sudden traffic stops), almost no one could do it without crashing if they were texting at the same time. Rest assured, you are not an exception. Finally, not only is texting while driving dangerous, it is against the law. 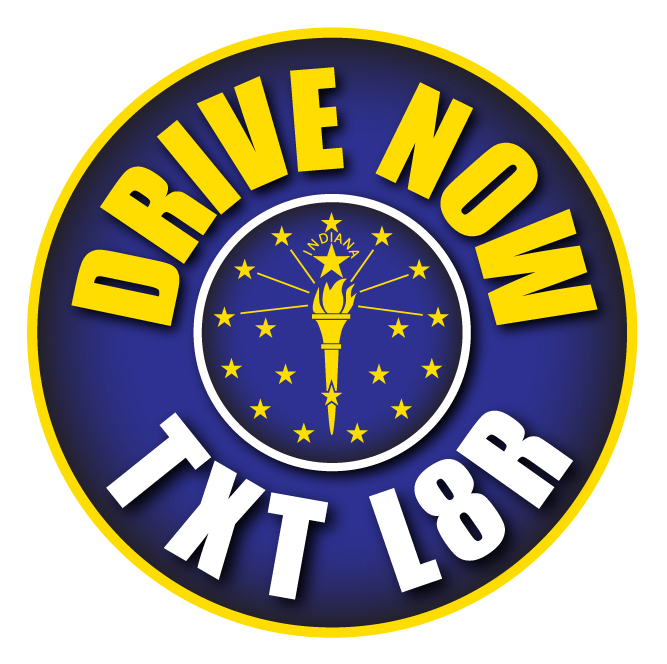 Effective July 1, 2011, it is unlawful to type, transmit, or read e-mail or text messages on a communication device while driving in Indiana. Violators may face fines of up to $500. Texting and driving is dangerous for you, your passengers, and everyone on and near the roads. If that isn't enough to convince you, consequences will be expensive and severe. For more information about texting while driving or distracted driving, please visit Distraction.gov.